Phosphorus (P) is essential to all known life forms because it is a key element in many physiological and biochemical processes. Soil properties due to soil formation processes and land use have an impact on the availability of phosphorus in soil and on the change in geochemical fractions. The phosphorus fractions are important for assessing their soil status and understanding the soil chemistry that affects soil fertility. Taken 43 soil samples, were selected from agricultural fields of Isparta - Southeast of Turkey, to determine the availability of phosphorus and change in fractions. Relations of phosphorus fractions with soil properties were revealed by analysis of variance, Pearson correlation analysis Descriptive physicochemical analyzes and sequential phosphorus fractionation were performed in the soil. These fractions are; sodium bicarbonate (NaHCO3-P) , sodium hydroxide (NaOH-P), citrate bicarbonate dithionite (CBD-P), hydrochloric acid (Ca-P), and residual (Res-P) phosphorus. The results showed that the fractionations (Ca-P, 597.05 mg kg-1) (Res-P, 259.54 mg kg-1) were high for respectively. It was determined that the fractal distribution of these fractions changed according to the land use pattern. Key Words: Phosphorus (P), soil properties, hydrochloric acid, Pearson correlation analysis. El fósforo (P) es esencial para todas las formas de vida conocidas porque es un elemento clave en muchos procesos fisiológicos y bioquímicos. Las propiedades del suelo debido a los procesos de formación del suelo y el uso de la tierra tienen un impacto en la disponibilidad de fósforo en el suelo y en el cambio en las fracciones geoquímicas. Las fracciones de fósforo son importantes para evaluar el estado del suelo y comprender la química que afecta la fertilidad. Tomadas 43 muestras de suelo, fueron seleccionadas de campos agrícolas de Isparta - Sureste de Turquía, para determinar la disponibilidad de fósforo y el cambio en las fracciones. Las relaciones de las fracciones de fósforo con las propiedades del suelo se revelaron mediante análisis de varianza, análisis de correlación de Pearson. Se realizaron análisis fisicoquímicos descriptivos y fraccionamiento de fósforo secuencial en el suelo. Estas fracciones son; bicarbonato de sodio (NaHCO3-P), hidróxido de sodio (NaOH-P), ditionito de bicarbonato de citrato (CBD-P), ácido clorhídrico (Ca-P) y fósforo residual (Res-P). Los resultados mostraron que los fraccionamientos (Ca-P, 597.05 mg kg-1) (Res-P, 259.54 mg kg-1) fueron altos para respectivamente. Se determinó que la distribución fractal de estas fracciones cambiaba de acuerdo con el patrón de uso de la tierra. Palabras clave: Fósforo (P), propiedades del suelo, ácido clorhídrico, análisis de correlación de Pearson. Phosphorus is an essential element for plant growth, crop production and quality. Due to low P availability in soil and low fertilizer use efficiency, farmers often apply P fertilizers in excess of plant requirements. Plants take up only 10-20% of the P applied with fertilizers in the year of application because the majority of applied P is rapidly fixed or precipitated into poorly available forms 24. Many soil constituents react with P to convert it into unavailable forms and the dominance of individual fraction is largely controlled by soil properties. The amount of P fertilizer needed depends not only on the crop P requirement, but also on the amount of extractable soil P and the P fixing capacity of the soil. Discrimination between phosphorus fractions, as well as between soils, is generally found to be statistically significant at the reliable level. The Ca-P fraction contains a significant amount of CB-P (phosphorus impregnated by carbonates), CBD-P (phosphorus occluded is hydroxyl oxides and iron oxides) and Al-P + Fe-P (phosphorus occluded is aluminum and iron) and Residual-P fractions 10. The Ca-P fraction, determined as the predominant inorganic phosphorus fraction in the rice paddy, has been found to decrease continuously due to the decrease in CaCO3 content of soils 10. Phosphate ions also become unusable by forming precipitates by combining with elements such as Ca, Mg, Al and Fe in the environment 9, 10. The plant varieties and genotypes grown in the soil showing phosphorus deficiency often have a root system of eaves extending to the side and to the side of the soil 11. It has been found that the increase in Al-P and Fe-P in acidic soil is mainly due to the reductive solubility and the predominance of Occluded-P forms, less than the reduction in Ca-P 20. Marked variation in the different forms of inorganic P is a function of genetic differences among soils 4. Organic matter, calcium carbonate and sesquioxides appear to be guiding factors in determining the distribution of forms of P 3. Saltali et al. 18 have shown that the organic and inorganic P fractions decrease significantly. Dieter et al.5, the proportional amount of inorganic and organic phosphorus extracted with 0.5 M NaHCO3 and extracted with anion exchange membrane rated Labil / mobile P varied between 4.7% and 11.4%. Achat et al. 1 the results show the dominant role of aluminum and iron oxides and organic carbon in the control of the dynamics of phosphate ions in acidic and non-acidic soils. Alovisi et al. 2 showed that the effect of inorganic fertilizer on the moderate and labile P fractions was high. The NaHCO3-Po fraction in the organic P fractions was observed to be the only fraction that contributed to the plant nutrition. In the light of the available literature, this study tried to show the effects of soil properties and applied agricultural practices, descriptive statistics and Pearson correlation on phosphorus fractions in Isparta soil. Taken 43 soil samples, were selected from agricultural fields of Isparta - Southeast of Turkey, to determination of phosphorus availability and change in fractions. Surface soil samples were air-dried and sieved through 2 mm mash openings, Then the soil properties are determined by the methods used: organic matter (OM) by modified Wakley-Black wet oxidation with potassium dichromate (K2Cr2O7), soil reaction and electrical conductivity by means of pH-meter and Wheatstone bridge in the saturated paste, cation exchange capacity (CEC) by using the method of sodium acetate (1 M pH 8.2) saturation and ammonium acetate (1 M pH 7.0) replacement, Lime equivalents of soils were determined by volumetrically measuring the carbon dioxide minerals from the treatment with 10% HCl (W / V) by means of Scheibler calcimetry 16. Soil texture was determined by Bouyoucos hydrometer 6. The summary of soil properties was given in Table 1. 2. Moderately labile P (NaOH-P) the residues from the previous sequence were treated with 50 mL of 0.1 M NaOH at 1:50 for 17 h. This was also partitioned into organic and inorganic NaOH-P.
3. Reducible P (Fe-P): extracted with citrate-bicarbonate-buffer system (CBD-P). 4. Ca-bound P (Ca-P): extracted with 1 M HCl for 1 h on a shaker. 5. Residual P (Res-P) the residues from the forgoing fractionations were acid digested with concentrated HNO3- HCl mixture (3:1, V/V). After the sequential procedures, the phosphorus concentrations of the supernatant obtained were calorimetrically determined using the method of Murphy and Riley (15) at 880 nm wavelength. Descriptive statistical analyzes were applied to the Physico-chemical properties and phosphorus fractions of soil (concentration and proportional values) in the SPSS 22 package program. Then, the correlation between the soil properties and phosphorus fractions was examined by conventional correlation analysis. The basic descriptive statistics for different phosphorus fractions shown in Table 2. In Table 2, the majority of the fractions showed typical normal distribution and their skewness and / or kurtosis value ≤ 2 x standard errors. The available P to plant (NaHCO3-Po, NaHCO3-Pi, NaOH-Pi and NaOH-Po) shows high positive skewness. This stimulation indicates that there is an excessive increase in this fraction, especially in some soils, due to the effects of the practices and / or soil formation processes generally done in the soil. This is an expected situation when the size of the study area and the similarities in the soil formation processes are taken into consideration, in particular the similarity of the climate and the mainstream in general. Positive skewness data means that there is a tendency to enrich for P fractions in some soils with significantly higher analytical values than the majority of soils. This can show that fertilization P is converted to a high positive fraction. Depleted-P from the primary mineral structure and/or fertilizer-P was likely to accumulate in Ca-P and/or CBD-P depending on the abundance of the Fe/Al oxides or carbonate minerals and governing thermodynamic conditions. This situation is expected when Ca-P compounds are thought to be more stable in alkaline calcareous conditions and have lower Fe solubility 13, 21. Given low skewness, it may indicate extinction due to conversion or loss of the relevant fraction. Res-P fraction is the low skewness. Much of the organic matter-induced activity has been stripped away at earlier stages (in particular, alkali extraction steps such as NaHCO3 and NaOH). There is still a small fraction of organic matter that is not alkaline hastened but which can be oxidized, a relatively low skewness factor in the data set. The averages of determined P fractions (Table 2, Fig 1) were: NaHCO3-Pt 24.16 mg kg-1 ; NaHCO3-Pi 20.69 mg kg-1 ; NaHCO3-Po 3.47 mg kg-1 ; NaOH-Pt 77.84 mg kg-1 ; NaOH-Pi 72,02 mg kg-1 ; NaOH-Po 5.82 mg kg-1 ; CBD-P 132.34 mg kg-1 ; Ca-P 597.05 mg kg-1 ; Res-P 259.54 mg kg-1 . Ca-P Fraction, low skewness coefficient 0.98 and kurtosis coefficient 0.60. This means that with continuous fertilization, this fraction generally increases (can be observed from the concentration values) but it may lead to a reduction in the proportion of this fraction in areas where composting is relatively uncommon or underdeveloped. Some soil Physico-chemical properties, Pearson correlation coefficients of P fractions given in Tables 3 and 4. The positive correlation between available phosphorus fractions of the soils NaHCO3-Pi fraction and OM (r = 0.581**), EC (r = 0.476**), sand (r = 0.329*), NaHCO3-Pt (r = 0.993**), NaOH-Pt (r = 0.358*), NaOH-Pi (r = 0.397*). The fertilization program can explain positive correlation. The decrease in the content of clay increases the amount of available phosphorus, which can be considered to be related to adsorption mechanisms. . Maranguit et al. 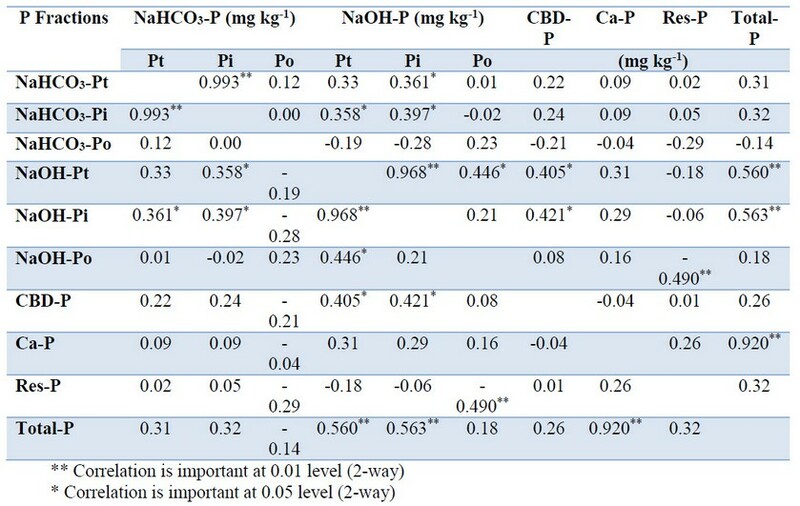 14 found High positive correlation was observed between the available P fractions (H2O-Pi, NaHCO3-Pi and Po) and the total organic P amount and carbon content. NaHCO3-Po was found to be positively correlated with OM (r =0. 590**). Positive correlation indicates that the increase in organic matter in the soil may be the result of increased fertilization of the soil, which is usually related to the presence of perennial plants, especially fruit trees in the field. Actually, Alovisi et al. 2 have shown that inorganic P fertilizers significantly increase moderate and labile P fractions. On the other hand, available phosphorus has reported that the most contribution is from the organic P fractions to the NaHCO3-Po fraction. NaOH-Pi Fraction positively correlated with OM (r = 0.609**), NaHCO3-Pt (r = 0.361*), NaHCO3-Pi (r = 0.397*), NaOH–Pt (r = 0.968**), CBD-P (r = 0.421*) and Total-P (r = 0.563**). Positive relationship is the function of the adsorption mechanisms, as previously mentioned, with the surface bound to this fraction (usually bound to Fe and Al, OH surfaces) and the decrease in clay quantity. Uygur et al. 22 found significant relationships between Fe and Al and NaOH-Pi that could be extrapolated by CBD. In this respect, surfaces of oxide minerals are an important component in the adsorption of mineral P 8, 23, 25. NaOH-Po Fraction positively correlated with NaOH-Pt (r = 0.446*). Positive relationship can be explained mainly for different reasons: i) Because NaOH is alkaline, it can extract organic matter in considerable quantities, ii) Fractions of organic matter or soil organic matter, such as humic acid and fulvic acid, are in competition with phosphate ions for the adsorption surfaces of the soils. Yi-Chao et al. 26 showed that NaHCO3 and organic P extractable with extractable inorganic P and NaOH are significantly associated with miner P fertilization. CBD-P Fraction positively correlated with OM(r = 0.574**), NaOH–Pi (r = 0.421*). Positive relationship can be explained by fertilization practices in general. The more fertilizer applied to any soil, the higher the availability of fractions (CBD-P, Ca-P and Total-P) in the fractions with high availability in the short run (fractions extractable with NaHCO3 and NaOH) and in the long run at low fractions for buffering the high quantity fractions. Ca-P fraction in soils was correlated positively with OM (r = 0.497**), Lime (r = 0.335*), EC (r = 0.320*) andTotal-P (r = 0.920**). The relationship between Ca-P and the extractable phosphorus fractions OM can be explained by the plant cover-induced fertilization practices, positive correlations with other properties can be considered because of phosphorous fertilization applied in the region. Actually, negative correlations were found between Ca-P fraction and clay properties in this study. It is thought that the soil components may cause clay adsorption and / or precipitation reactions instead of the Ca-P fraction of P added to the soil when the soil components are high. Patiram et al. 17 found that the different forms of P in acidic soils did not change significantly in the fractions of Al-P and Ca-P. Tandon, 20 found Ca-P in the Indian soil represents about 40-50% of total P in calcareous and neutral soils. Res-P fraction in soils was correlated positively with CEC (r = 0.392*). The relationship with the CEC points to an increase in the ability to retain P in soil formation processes due to high clay minerals. Shukla et al. 19 and Uygur et al. 21 found that the residual fraction in the calcareous soils was in relatively high quantities. Descriptive analyzes have shown that although some similarities exist in the soil, some soils show distinct differences. The averages of determined P fractions were: NaHCO3-Pt 24.16 mg kg-1; NaHCO3-Pi 20.69 mg kg-1 ; NaHCO3-Po 3.47 mg kg-1 ; NaOH-Pt 77.84 mg kg-1 ; NaOH-Pi 72,02 mg kg-1 ; NaOH-Po 5.82 mg kg-1 ; CBD-P 132.34 mg kg-1 ; Ca-P 597.05 mg kg-1 ; Res-P 259.54 mg kg-1 . It can be concluded that the division of phosphate fertilizers between the geochemical fractions of phosphorus is largely related to the organic matter, the calcium carbonate equivalent and the soil texture content in the soil. In order to increase the use of phosphorus in the soil structure, which show different behaviors according to the changing soil properties, plant fertilization and reduce P contamination, it is necessary to determine the form and amount of fertilization system according to soil properties carefully. 3. Brady, N.C. and Weil, R.R. 2002. The Nature and Properties of Soils. 13th edition. Prentice Hall, Upper Raddle River, New Jersey. 8. He, Z. L., Yang, X., Yuan, K. N., Zhu, Z. X., 1994. Desorption and Plant-availability of Phosphate Sorbed by some Important Minerals. Plant Soil, 162 (1), 89–97. doi:10.1007/BF01416093. 9. Karaman, M.R., 2012. Plant Nutrition. Gaziosmanpasha University Faculty of Agriculture Publications, Publication No: 14021, 1066s, Ankara. 10. Kacar, B., Katkat, A. V., 2009. Plant Nutrition. Ankara University Faculty of Agriculture Publications, Publication No: 849, 659s, Ankara. 11. Kacar, B., 2013. Basic Fertilizer Information. Ankara University Faculty of Agriculture Publications, Publication No: 695, 502s, Ankara. 12. Kuo, S. 1996. Phosphorus, Methods of Soil Analysis Part 3, Chemical Methods (869-920). Soil Science Society of America, Series No: 5, WI, USA. 13. Lindsay, W.L., 1979. Chemical Equilibria in Soils. John Wiley and Sons, New York, USA. 16. Nelson, D.W., Sommers, L.E., 1982. Total Carbon, Organic Carbon and Organic Matter. In Page, A.L. et al (Eds) Methods of Soil Analysis, Part 2. Chemical and Microbiological Properties (539-579). Second Edition, Soil Science Society of America, Agronomy No: 9, WI, USA. 20. Tandon, H.L.S., 1987. Phosphorous Research and Agricultural Production in India. Fertility Development and Consultant Organization. Food and Agriculture Organization of the United Nations, Greater Kailash 1, New Delhi. 21. Uygur, V., Karabatak, I., 2009. The Effect of Organic Amendments on Mineral Phosphate Fractions in Calcareous Soils. Journal of Plant Nutrition and Soil Science, 172(3), 336-345. doi:10.1002/jpln.v172:3.